Hi everyone! It’s Missy, Mel’s bulldog. It’s great to be a dog whose human owns a pet shop. There’s always an abundance of the most delicious treats, and I play with the best toys. I have my own posh comfy bed in Mel’s office, and a fabulous dog sofa next to the big window where I can take a relaxing afternoon nap in the sun. My days are filled with people telling me how sweet I am, belly rubs, and the best behind-the-ear scratches. On the days I don’t go to the shop, Mel brings home something extra special. Last week she brought home the best un-birthday peanut butter cake just for me. I think she misses me when I’m not around. It’s not all rainbows and unicorns though (I’m not exactly sure what the means, but I heard Betty Foxx say it when she was having a bad day). The downside is sometimes you’re the guinea pig for ugly sweaters, tutus, and girly dresses. Ugh! I’m a bulldog, not a doll. It’s especially bad this time of year—Halloween. Pet costumes are flying off the shelves, and some of them are ridiculous. The most popular are the pumpkin and hot dog. I don't get it. 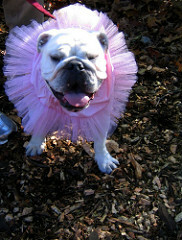 Why would anyone want to be anything but a bulldog? I sure hope Mel doesn’t cave and dress me in Betty’s suggestion...a CAT! I think I’ll hide in the office until Halloween is over. Oh, before I go, I’m supposed to tell you that Barking with the Stars, book nine, will be released this November. Hey, that’s next month! I bet Caro stops by next time to tell you all about it.